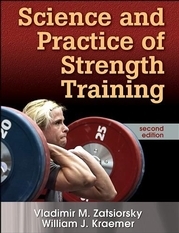 This new second edition of Science and Practice of Strength Training comes with many additions and changes. A new coauthor, Dr. William Kraemer, joins Dr. Vladimir Zatsiorsky in expanding on the principles and concepts needed for training athletes. Among Dr. Kraemer’s contributions are three new chapters targeting specific populations—women, young athletes, and seniors—plus the integration of new concepts into the other chapters. A reference for strength and conditioning specialists and researchers and exercise physiologists. Also a course text for graduate-level students in strength and conditioning courses and exercise physiology courses. Vladimir Zatsiorsky, PhD, is a professor of kinesiology at Penn State University in State College, Pennsylvania. A strength and conditioning consultant for Olympic teams from the former Soviet Union for 26 years, Zatsiorsky has trained hundreds of world-class athletes. He has also authored or coauthored 15 books and more than 350 scientific papers. His books have been published in several languages, including English, Russian, German, Spanish, Chinese, Japanese, Portuguese, Italian, Polish, Czech, Rumanian, Serbo-Croatian, Hungarian, Bulgarian. He has received honorary doctoral degrees from universities in Poland and Russia and is an honorary member of the International Association of Sport Kinetics. In his spare time, he enjoys reading, listening to classical music, and exercising. William Kraemer, PhD, is a professor in the department of kinesiology at the University of Connecticut at Storrs, where he works in the Human Performance Laboratory. He also is a professor in the department of physiology and neurobiology and a professor of medicine at the University of Connecticut Health Center. Kraemer held multiple appointments at Pennsylvania State University, where he was professor of applied physiology, director of research in the Center for Sports Medicine, associate director of the Center for Cell Research, and faculty member in the kinesiology department and the Noll Physiological Research Center. Kraemer has served on the Sports Medicine Committee for the United States Weightlifting Federation and on the Sport Science and Technology Committee for the United States Olympic Committee. He received the Provost's Research Excellence Award from the University of Connecticut in 2005 and National Strength and Conditioning Association Lifetime Achievement Award for bringing science into the development of strength and conditioning programs. He is editor in chief of the Journal of Strength and Conditioning Research, an associate editor of Medicine and Science in Sports and Exercise, and an editorial board member of the Journal of Applied Physiology. A former junior high and college coach, Kraemer has coauthored many books and articles on strength training for athletes. "It's now in its second edition and it's a great book. Here's why. The authors have combined Eastern European and North American resistance training practices to present a truly global perspective on current theories on how athletes should train. Compared to the first edition, this edition is much more practical."